The British Film Institute employs so many different outlets for its films these days that it’s difficult to keep up. What with the Mediatheque, Creative Archive, Screenonline, European Film Treasures, filmarchives online, its vast website and MySpace page, alongside the traditional outlets of DVD, book publishing and cinema exhibition, it’s becoming hard to escape their mission to inspire us all. Yet it’s still possible to overlook some of their activities, such is their number, as I’d done until now with their YouTube channel. The BFI has contributed to several other YouTube sites, wittingly (e.g. 10 Downing Street and The Royal Channel) or unwittingly (take your pick), but for a few months now it has also had its own channel. And what gems are there. There are sixty-four titles at present, and all are films which the BFI owns or for which there is no rights claimant, and so there’s an emphasis on silent shorts. Several of these are available from other BFI outlets, and all are featured in the Mediatheque, so the site serves as a taster, and no harm with that. So, for example, there are numerous clips from The Open Road, Claude Friese-Greene’s two-colour travelogue of 1924/25, which has already seen the recent light of day as a television programme and two DVD releases. Or here’s another old favourite, Oyster Fishing in Whitstable, England – apparently an American production from 1921, though actually it’s a repackaging of a pre-First World War British film. An old favourite firstly because I was brought up in the fair town of Whitstable (and it hasn’t changed much), secondly because it’s a harmoniously accomplished example of early non-fiction ‘interest’ film, and thirdly because the subject of much of my research work, Charles Urban, the film’s producer, can be seen towards the end as one of a crowd on the beach sampling oysters (he’s the one crouching down on the right, wearing a hat). The films all come with knowledgeable background descriptions from one or other of the BFI curators (a marked difference to many YouTube offerings). There are newsreels, magazine films, travels films, phantom rides, actualities, a recreation of Kinemacolor (more on that at another time) and much more. There are also several sound films of course (check out Geoffrey Jones’ glorious Snow, a brilliantly edited 1963 piece from the esteemed British Transport Films)). Fascinatingly, the most popular title so far is An Otter Study, with its underwater photography (the titles comes from the 1920s, but the original film was made by Urban’s Kineto company in 1912). Others are bound to feature in later posts. Go explore. In this our year of colour, here’s a call for papers on a pertinent conference, which comes out of an ongoing three-year research project at the University of Bristol which is examining the histories of Kinemacolor and Technicolor in Britain. We invite abstracts of c.200 words for individual papers or pre-constituted panels consisting of 3 papers to be submitted by 1st September 2008. Please send abstracts to dram-colourconference@bristol.ac.uk. If you prefer to submit your abstract by post, the address is as follows: Colour and the Moving Image Conference, c/o Dr Liz Watkins, Department of Drama: Theatre, Film, Television, Cantocks Close, Woodland Road, University of Bristol, Bristol, BS8 1UP, UK. 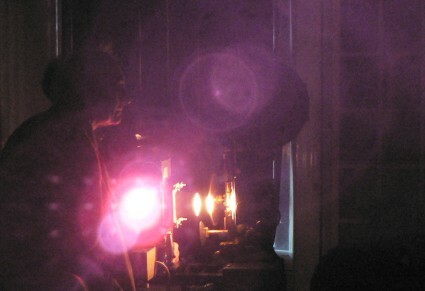 Colour and the Moving Image: History, Theory, Aesthetics, Archive is hosted by the Department of Drama: Theatre, Film, Television, University of Bristol, UK with support from the Arts and Humanities Research Council. Screenings in co-operation with the BFI National Film Archive, UK and supported by Screen as one of its 50th Anniversary regional events. must be able to attend the conference as scheduled. Eligibility: Full-time matriculated Undergraduate and Masters students at any point in their academic career, not affiliated with any employee or volunteer of the Buster Keaton Celebration, the Kansas Humanities Council or the Bowlus Fine Arts Center. 1. Applicants must complete an application to Frank Scheide or by sending a letter to Susan Raines, Bowlus Fine Arts Center, 205 East Madison, Iola, KS 66749-0705). Proof of current matriculation will be required as part of this application. 2. Applicants must submit their complete 30- to 40- minute presentation script for committee review, along with the above application, by the due date of May 1, 2008 along with images to be used in the final PowerPoint document. The applicant must also present evidence that images he or she wishes to use are available and in the applicant’s possession. Scripts must be typed and double-spaced (they may be in essay format, marked with indications as to what images will be utilized where in the presentation). Please do not submit the final PowerPoint demonstration. To learn more about this year’s topic, please read the essay “Buster Keaton and Will Rogers: American Comic Heroes”, which can be found by visiting the Buster Keaton Celebration web site at http://iolakeatoncelebration.org. Committee members will be looking for original approaches to this topic and are especially interested in papers linking the two performers in some manner. The Celebration Student Presenter committee will choose one winner and one runner-up, who will serve as an alternate. An announcement of the winner will be made by June 1st. The winner will have until June 30th to accept or decline the award. He or she will then have until July 31st to make his/her travel arrangements (assistance with this task will be provided by a committee volunteer). The winner will receive a spot on the schedule and a stipend of $200 and travel expenses up to $300 (airfare or mileage) to facilitate his/her attendance. Lodging and a daily food allowance will be provided by the Buster Keaton Celebration from Thursday evening, September 25th, through breakfast on Sunday, September 28th. The chosen Student Presenter will be assigned a Celebration volunteer to assist with any and all parts of the actual presentation process, during the two days of the festival, in order to make the experience a successful and rewarding one for the studentand for the Celebration attendees! Now how about a festival of PowerPoint one day? It’s the magic lantern de nos jours. It’s been a long time in coming, but it’s been well worth the wait. Today saw the launch of WildFilmHistory, a site dedicated to recognising 100 years (so they say) of wildlife filmmaking. Produced by the Wildscreen Trust and supported by Lottery funding, this is a multimedia guide to one hundred years of natural history filmmaking, from the pioneering days when stop-motion films of flowers opening wowed them in the music halls to the age of Attenborough and beyond. The site is biographical in focus, and at its centre are ninety-one (so far) mini-biographies of wildlife filmmakers, twenty-nine of them with accompanying oral history recordings, which very usefully come with PDF transcripts. So you get interviews with the likes of David Attenborough, Hans and Lotte Haas, Desmond Morris, Tony Soper and the late Gerald Thompson, but also the academic Derek Bousé, whose excellent history Wildlife Films investigates our period – more of which below. There’s also a very useful timeline. Das Boxende Känguruh (1895) – Max Skladanowsky’s film of a boxing kangaroo and its trainer Mr Delaware. Rough Sea at Dover (1895) – Something of a surprise choice, Birt Acres’ self-explanatory film which they argue is “considered by some to be the first natural history orientated film”. Pelicans at the Zoo (1898) – Pelicans at Regent’s Park Zoo, made by the British Mutoscope and Biograph Company, a breathtakingly beautiful film if seen on 35mm (it was originally shot on 70mm), a little more prosiac in Flash. Spiders on a Web (1900) – A new one on me. This was apparently made by G.A. Smith and features two spiders in close-up, viewed through a circular mask (but no web to be seen). Clearly an extract from a longer film. St. Kilda, Its People and Birds (1908) – Made by Oliver Pike, this shows both human and animal life on St kilda, off Scotland, at a time when it was still inhabited by people. The Birth of a Flower (1910) – Exquisite stop-motion photography of flowers opening, complete with stencil colouring, made by the great Percy Smith for Charles Urban. The History of a Butterfly – A Romance of Insect Life (1910) – A fully-fledged natural history film, made by James Williamson, with a fair bit of nitrate damage to remind us of the precious state in which some of these films survive. The Strength and Agility of Insects (1911) – Eye-popping pyrotechnics performed by flies, who juggle corks, twirl matchsticks etc. This is actually a re-issue of an earlier film, The Balancing Bluebottle (1908), filmed by our hero of the era, Percy Smith, for Charles Urban once again. No animals was injured during the making of this film (honest). Secrets of Nature: The Sparrow-Hawk (1922) – One of the famous British Instructional Films series of educational films from the 1920s/30s, this was made by Captain C.W. R. Knight (the site’s synopsis mistakenly says in one place that Percy Smith made the film, though he was associated with many Secrets of Nature productions) (Captain Knight turns up twenty years later as the eagle-tamer in Powell and Pressburger’s I Know Where I’m Going, trivia fans). With Cherry Kearton in the Jungle (1926) – Cherry Kearton was the most celebrated naturalist of the era, and with his brother Richard more or less pioneered the art of wildlife photography and then cinematography. This is a ‘greatest hits’ compilation of some of his African natural history films. Simba (1928) – An African travelogue (extracts only) made by the enterprising American couple Martin and Osa Johnson, blending actuality with staged scenes, and alarmingly also blending shooting with both camera and gun. Dassan: An Adventure in Search of Laughter Featuring Nature’s Greatest Little Comedians (1930) – Cherry Kearton anticipates The March of the Penguins by several decades. And so it continues up to the present day, with many marvellous clips which both amaze and cause a sigh of happy nostalgia (Zoo Quest, Jacques Cousteau). A little oddly, the site includes pages for films that they haven’t tracked down yet – these include Oliver Pike’s In Birdland (1907), which they argue was the first true wildlife film (hence the centenary), but unfortunately no copy is known to exist. This is a very well produced site, on which a huge amount of effort has been expended on clearing and producing the clips, esearching the history, and presenting the interviews. The early film clips are wonderful to see, even if I miss one or two titles that I think should have been there (e.g. Herbert Ponting’s fine penguin footage from his films of Captain Scott’s Antarctic expedition). The site opens up the history of wildlife film, demonstrating an interconnected heritage, championing excellence, and encouraging us all to find out more. So, if you are interested in finding out more, where should you go? Well, as mentioned, I strongly recomennd Derek Bousé’s Wildlife Films (2000). This is a first-rate history of wildlife filmmaking and television production, good not only on the plain history but on the mysteries of the genre, which ever since its earliest days has had to adopt assorted entertainment strategies, particularly storytelling, to make its work palatable to a mass public. It is thoughtful and informative. Also recommended is the similarly thought-provoking Animals in Film (2002) by Jonathan Burt. There’s also the recent BBC publication, Michael Bright’s 100 Years of Wildlife (2007), which is aimed at the popular end of the market, but does at least name check people such as Kearton, Smith and Urban. WildFilmHistory is a wonderful resource, which promises to grow and welcomes any information on new material that they might use. In the spirit of the great filmmakers it champions, go explore. We continue with our series on the history of early colour cinematography, but take a diversion out of the past to the present day – Monday February 25th, to be precise – for the very best of reasons. Because today, at the British Film Institute’s J. Paul Getty Conservation Centre in Berkhamsted, Hertfordshire, we witnessed a rare recreation of ‘true’ Kinemacolor. The screening was organised by film archivists David Cleveland and Brian Pritchard, who decided to mark the centenary of Kinemacolor by exhibiting the world’s first natural colour motion picture system in its correct form, using an original Kinemacolor projector. Kinemacolor films have been shown in composite colour or computer synthesized forms, or so customised that they will run at normal speed on a normal projector, but not since 1995 at the Museum of the Moving Image has anyone attempted to show Kinemacolor as it was originally done – black-and-white film run through a projector fitted with a red and green rotating filter, at double speed (thirty or more frames per second). It is rarer still to employ an original projector (the MOMI show used a customised 1920s Ernemann projector). The projector was generously loaned by Wirral Museum, which also allowed the archivists to replace missing parts and to make the machine operable, so long as it would be returned to its original museum state once they had finished with it. It is Kinemacolor projector no. 19, with original colour filter. 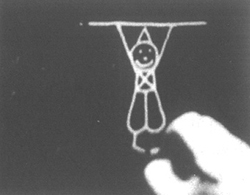 Cleveland and Pritchard aimed to be as authentic as possible, with two limitations – they could not show nitrate films, fairly obviously, and for similar health and safety reasons they could not use an arc light (they used a filament blub instead). We gathered in a small room, with chandelier adding an appropriate touch of class to the proceedings (less so the windows necessarily blacked out with black bags and tape). The small audience comprised archivists from the BFI National Archive, a smattering of academics, and as guests of honour, Kinemacolor’s producer Charles Urban’s step-grandson Bruce Mousell and his two daughters. David introduced the event and the projector, then we were shown three of the sample Kinemacolor films held in the BFI National Film Archive. Tragically few Kinemacolor films survive today, and all that the UK’s national archive holds are some test films which were never shown publicly. These were retained by the system’s inventor G.A. Smith, who passed them on to Brighton collector Graham Head, whose collection in turn went to the Cinema Museum in London. Two of the prints we saw were therefore struck from original negatives, with a third taken from a dupe neg. This film was shown first, Cat Studies (c.1908), a short single shot of a cat (a black-and-white cat at that), which served to help make adjustments to the filter, since we started off with the wooden board with a hole through which the cat looked appearing green, because the rotating filter had been aligned incorrectly. There then followed Woman Draped in Patterened Handkerchiefs (c.1908), whose action is self-explanatory, a film clearly designed to demonstrate basic colour effects; and Pageant of New Romney, Hythe and Sandwich (1910), an actuality film rejected at the time for being too contrasty. 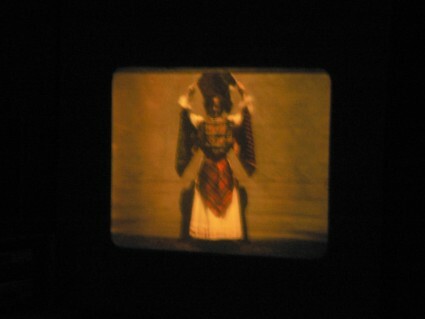 In truth, the sample Kinemacolor films held by the BFI are poor examples of the colour system, showing little in the way of effective colour, and the latter film in particular demonstrating the hazards of fringing (the alternating red/green records meant that the film record could not always keep up with movement, resulting in red or green ‘fringes’). But, after a pause for reloading and a talk from Brian Pritchard on the customising of the projector and Smith’s ingenious use of sensitizing chemicals (without which Kinemacolor would not have worked at all), we were shown a beautiful Kinemacolor film loaned by the Nederlands Filmmuseum. This was Lake Garda, Italy (1910), a travelogue of the Italian beauty spot, whose picture postcard images showed up the colour to exquisite effect. We saw panoramic views of the lake, buildings, boats with red and yellow sails, and a delightful sequence where three musicians in a small boat serenaded the camera. Being full of gentle motion, the muted, subtle colour was shown to its best effect, being particularly good at rendering white buildings and reflections in the water. Kinemacolor, using as it did red and green filters, could not logically depict blue, yet blue we saw in the sky and water. This is all down to our gullible brains, reconstituting what seems optically logical to us. The sky should be blue, so we see blue. What was also interesting was the colossal noise. The motorised projector had to rattle through at a speed of thirty frames per second, and the racket drowned out all conversation. The image on the screen had to be kept quite small, to retain as much brightness as possible (Kinemacolor absorbs a great deal of light). We all wondered how on earth they coped projecting Kinemacolor in large theatres, where the throw would have been considerable. 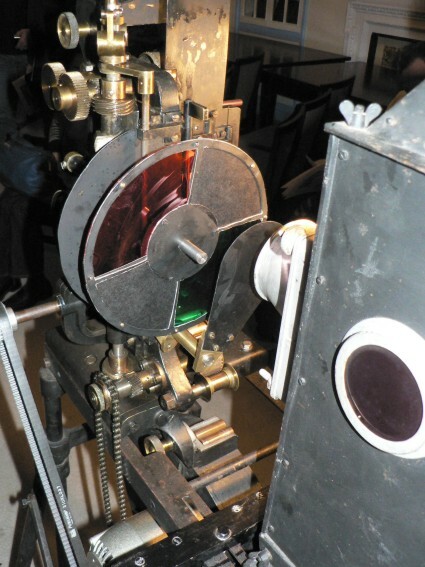 We also marvelled at the skill of the original projectionists, who had to cope not only with a double-speed projector, but changing colour effects owing to differences in filters used (the cameramen would change then accoding to the light conditions encountered) and all of the hazards of correct colour synchronisation. Several archives have a few examples of Kinemacolor films in their collections, and the usual process is to make a composite film copy of the red and green images onto one new Eastman Color inter-negative, and normal colour prints therefrom. Of course this takes on Eastman Color characteristics, and the colour is not the same as originally seen. Scanning is probably the answer, but here again it needs to be carefully done so that the colour is as near to the original filters as possible … and that the result is not a smooth ‘television’ type picture, but an image that resembles the projected picture of a century ago. Only this way can Kinemacolor be put into context with the development of colour films. It is a great shame that, in its centenary year, Kinemacolor remains so elusive. Cleveland and Pritchard had the greatest difficulty getting films from other archives, and it is to be hoped that there may be greater co-operation over any future events. 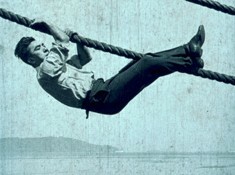 So few Kinemacolor films survive (maybe thirty or so, out of the hundreds originally produced), and more must be done to preserve them, to make them accessible in original as well as the more convenient composite form, and to uncover more – because there are undoubtedly ‘lost’ Kinemacolor films out there. Kinemacolor appears to be ordinary silent black-and-white film to the untrained eye. Only when you look closely do you see alterations in tonal emphasis from frame to frame. Many archives, I am sure, are sitting on Kinemacolor films and are not aware of the fact. 2008 would be a good year in which to start conducting a search to locate them. Here at the Bioscope, when highlighting digitised resources, we tend to go for those that are freely available to all. However, it is worth pointing out some of those which are restricted to subscribers, institutions or educational users, either because you the reader may fall into such categories, or they may be resources that you can find (or request that they be subscribed to) at your local library. Which leads us to 19th Century UK Periodicals. This new resource describes itself as “a major new multi-part series which covers the events, lives, values and themes that shaped the 19th century world.” It’s being published in stages, and Series 1, on New Readerships, provides access to close to 100 periodicals, mainly based on the collections of the British Library and the National Library of Scotland. Five series are planned, across 600 journals, the others being Empire, Culture, Working Life and Knowledge. New Readerships is dedicated to the changes and influences in political and rural life, children’s literature and leisure, and includes such varied journals as The Northern Star, The Satirist, British Women’s Temperance Journal, The Boy’s Own Paper, Country Gentlemen, Pick-Me-Up, Little Wide Awake, Fun, Ladies Fashionable Repository, Bailey’s Monthly Magazine of Sport, and Punch. And there is plenty there for the early film researcher. Using our trustworthy test search term of Kinetoscope, we get 115 hits, starting with The Sporting Times facetiously noting the appearance of “Mr Edison’s latest little toy” in its edition of 20 October 1894, through to The Turf, on 13 October 1900, noting that the racehorse Kinetoscope would be running at the two mile Handicap Hurlde Race at Sandown on Saturday. I’m sure there’s an interesting paper to be written on the undistinguished racing career of Kinetoscope, whose naming after a contemporary technology anticipates Sanyo Music Centre and others of that ilk by several decades. Other terms such as Cinematograph (215 hits), American Biograph (175 hits), Mutoscope (31 hits), Animatograph (11 hits) or Bioscope (6 hits) bring up results that are fascinating not only for the incidental bits of concrete information they provide (particularly through advertisements), but also for they way they demonstrate how the idea of the medium swiftly became pervasive. You knew about the moving pictures through your light reading, before you might have had any chance to see them. Though several of our variety theatres announce exhibitions of war pictures, they are in reality nothing of the sort, but merely cinematograph pictures of the combatants preparing for the fight, or places of special interest at the present time, such as Pretoria, Kimberley, Mafeking, etc. Sightseers who believe they are going to witness an actual battle have hitherto been disappointed. But in the future this is likely to be altered, for the Warwick Trading Company, through their assistants at the front, have just received a consignment of films representing actual battles, skirmishes, etc., and these photographs are now being rapidly developed. Within a few days, therefore, all of us will doubtless have an opportunity of seeing what an actual battle looks like, and gain some idea of the horrors of warfare. Fascinating to see that desire for the horrors of warfare to be served up as entertainment in the variety theatres, and the use of term ‘sightseers’ to describe proto-cinemagoers. You can find out more about 19th Century UK Periodicals from the publishers, Gale. It’s not freely available, and do note these sorts of resources are aimed at (and priced at) institutions, not individuals. So go seek out your local institution. Just in at The Bioscope Library is one of the standard technical manuals of the period, and boon to many a film historian ever since, Colin Bennett’s The Handbook of Kinematography. 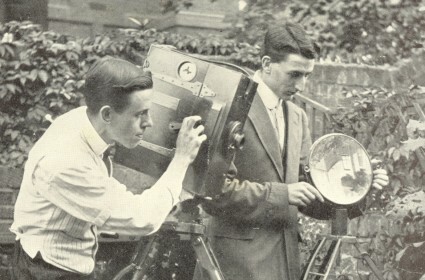 Bennett was a cameraman, inventor (he devised a colour cinematograph process, Cinechrome, in 1914) and regular contributor on technical subjects to the Kinematograph and Lantern Weekly. This handbook, published by the Kinematograph Weekly in 1911, is a thorough and handsomely illustrated account of early motion picture technology and the practicalities of producing and exhibiting films. All you needed to know, really. 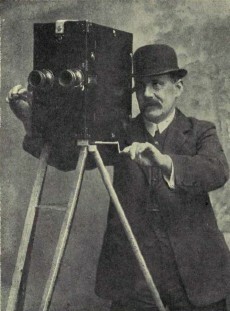 Some of Bennett’s understanding of film history is askew (particularly his patriotic championing of William Friese-Greene’s nebulous achievements), but for the motion picture technologies of the day his knowledge is prodigious, leavened with a lot of practical commonsense, and the illustrations alone (along with some contemporary advertisements) are a rich source of information. The book is available from our old friends the Internet Archive, in DjVu (16MB), PDF (44MB), b/w PDF (19MB) and TXT (689KB) formats. One of the frustrating things for the online early film researcher has been the lack of film reviews available from the film trade press, as opposed to those in newspapers, whose digitised availability has been covered here several times. One exception in the Pacific Film Archive’s Cinefiles database, mentioned recently. Another is the venerable American film journal Variety, a selection of whose archive reviews are being put online. It’s only a selection, so one hopes that it will continue to grow, but what’s there already is choice stuff, not least because they’ve selected some of the more familiar titles from the silent era. Seaching is either by word or by year, with a calendar of hyperlinks to individual years (some of them divided up into quarters). So, for the earliest year of the archive, 1914, you can find reviews on The Battle of the Sexes, The Escape, Home Sweet Home, Judith of Bethulia, Tess of the Storm Country and Tillie’s Punctured Romance. While for 1923 you get Anna Christie, Safety Last, The Christian, The Covered Wagon, Fury, Hollywood, The Hunchback of Notre Dame, Our Hospitality, Peg O’ My Heart, Ruggles of Red Gap, Scaramouche, The Ten Comandments, The Three Ages, The Wandering Jew and A Woman of Paris. Quite a year. With this Stoll picture Matheson Lang established a right to be regarded as a screen star. 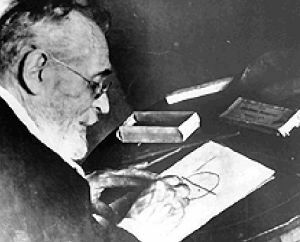 Throughout his impersonation of the Jew, condemned to wander through the ages, arrogant, proud, though broken-hearted, ever within reach of happiness, but always overtaken by disaster just as he is about to grasp his heart’s desire, is masterly. The story follows the Temple Thurston play fairly close. In the opening scenes we see the Jew, Matathias, and his lover, Judith, his reviling of the Saviour on His way to Calvary and the dreadful outlawry which sent him into the world a wanderer. Thirteen hundred years pass and he is among the Crusaders; again a lovely woman loves him, but again fate stands between him and happiness, and so the story goes down the years until at last the Inquisition gives him the peace and eternal rest which before have always been denied him. Spectacularly, the production is very fine and the subject is treated with great reverence by Maurice Elvey. Some stories are just naturally poison for screen purposes and Dorothy Scarborough’s novel here shows itself a conspicuous example. Everything a high pressure, lavishly equipped studio, expert director and reputable star could contribute was showered on this production. Everything about the picture breathes quality. Yet it flops dismally. Tragedy on the high winds, on the desolate desert prairies, unrelieved by that sparkling touch of life that spells human interest, is what this picture has to offer. It may be a true picturization of life on the prairie but it still remains lifeless: and unentertaining. The story opens with an unknown girl, Letty (Lillian Gish), from Virginia, train-bound for her cousin’s ranch, which she describes as beautiful to the stranger, Roddy (Montagu Love), who has made her acquaintance informally. Roaring, blinding wind and sandstorms immediately frighten the girl. She remains in a semi-conscious state of fright throughout, excepting at the close of the picture. At Beverly’s (Edward Earle) ranch the girl becomes too popular with Cora’s (Dorothy Cummings) children and is forced to leave. The girl then accepts a proposal from Lige (Lars Hanson), whom she had laughed at the night before. During a round-up of wild horses, brought down by a fierce northern gale, Roddy forces his way into Lige’s home and stays there for the night with Letty. All in all, a very welcome selection of classic reviews (which goes on up to the present day), which hopefully may be expanded in due course. The silent star of the moment is Sessue Hayakawa. 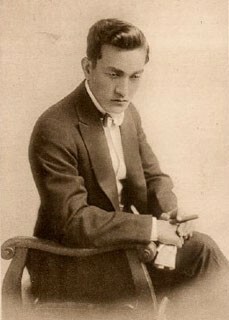 The Japanese-born star of American silents has been the subject of a critical study, film season and DVD releases, while an archive has announced that it has recently preserved a number of his films. This is a round-up of Hayakawamania. The critical study is Daisuke Miyao’s Sessue Hayakawa: Silent Cinema and Transnational Stardom (Duke University Press), which has already been the subject of a post on the Bioscope. There’s an online interview with Miyao on The Evening Class blog. Miyao’s work inspired a Museum of Modern Art exhibition, Sessue Hayakawa: East and West, When the Twain Met, which ran September 5–16, 2007 – details of the films shown are on the web page. Remembered mostly for his magnificent performance as the Japanese officer in The Bridge over the River Kwai, few filmgoers realize that Sessue Hayakawa was one of the great stars of the silent cinema. In many films he played a dashing, romantic lead — a rarity for Asian actors in Hollywood, even today. Hayakawa became so popular and powerful that he was able to start Haworth Pictures to control his own destiny. The Dragon Painter was the finest of the Haworth productions. Beautifully acted, gorgeously shot (with Yosemite Valley filling in for the Japanese landscape), and lovingly directed, the film is an absolute marvel. Long considered lost, The Dragon Painter was rediscovered in a French distribution print and brought to the George Eastman House for restoration with the original tints. The film survives today as a tribute to Hayakawa’s great artistry and a shining example of Asian-American cinema. The DVD comes with a remarkable set of extras, including the full-length feature, Thomas Ince’s The Wrath of the Gods (1914), starring Hayakawa, Tsuru Aoki and Frank Borzage; a copy of the script for The Wrath of the Gods; a 1921 short subject, Screen Snapshots (1921) with Hayakawa, Roscoe “Fatty” Arbuckle and Charles Murray; the original novel by Mary McNeil Fenollosa in PDF format; and the stills gallery includes Herbert Ponting’s exquisite images for his 1910 book In Lotus-Land Japan: Japan at the Turn of the Century (Ponting went on to be cinematopgrapher to the Scott Antarctic expedition). You can download a presskit for the DVD from www.milestonefilms.com/presskits.php. Other Sessue Hayakawa films available on DVD are The Cheat (1915) (from Kino in American and Bach Films in France) and The Secret Game (1917) (from Image Entertainment). Three Hayakawa films, or what remains of them, have recently been restored by the Nederlands Filmmuseum: The Man Beneath (1919), His Birthright (1918) and The Courageous Coward (1919): only The Man Beneath survives as a complete film. There is background information on the films, their restoration and Hayakawa’s career on the Filmmuseum site. Finally, there’s information on The Cheat and Forbidden Paths (1917), shown recently at the Pacific Film Archive.